In the winter it is often hard to find good veggies for a salad. My off-season go to salad is one that my mother would make with fruit, nuts and a sweet and sour dressing. I love this salad and you can vary the ingredients. 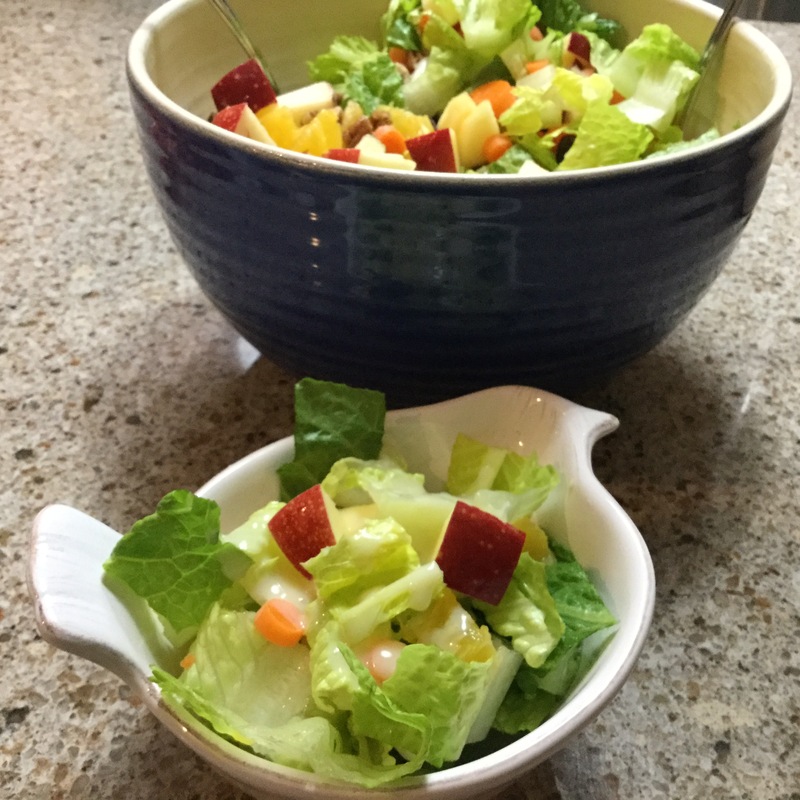 The recipe calls for a 1/2 head iceberg lettuce, but you can use any mix of greens. This time I used romaine and added a few chopped baby carrots. I then added a chopped apple and orange. You could add any fruit. Add dried fruit and nuts of choice. To make the dressing mix together evaporated milk and sugar, then add vinegar. The vinegar will thicken the dressing. Mix the salad and add dressing right before serving or allow guest to add their own dressing. I have never heard of using evaporated milk in a salad dressing! That sounds yummy! I am going to try this! It is yummy, hope you enjoy it. going to a paint in today. Sound good, So will the bring a salad with me today. Hi Phyllis, I hope your group enjoys it as much as my friends do. My mother-in-law has a very similiar recipe. She uses White Vinegar instead of Apple Cider Vinegar. Otherwise, identical. This Oklahoma recipe is used for coleslaw to Waldorf salad, (just lessen the amount of sugar for the coleslaw.) It is always a big hit. I am looking forward to trying your dressing!! Thank you Jane. Hi Pam, I am sure you could use white vinegar for this, my mother always used the apple cider. My mother would go to the county extension office where they would offer cooking demos and I think this is were she got the recipe. I hope you enjoy it as much as I do. Thank you Donna, I think the ingredients in the dressing fool you, but it is yummy.